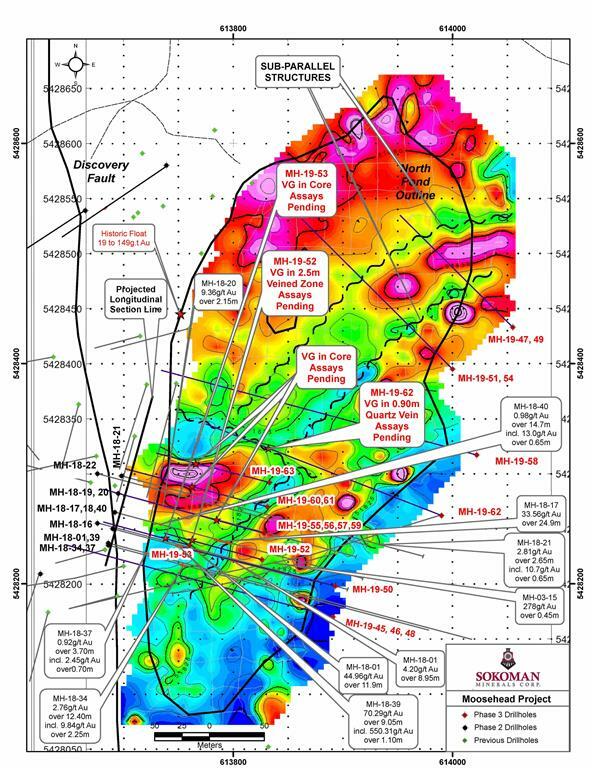 ST. JOHN'S, NL / ACCESSWIRE / March 19, 2019 / Sokoman Minerals Corp. (TSX-V: SIC) (OTCQB: SICNF) (the "Company" or "Sokoman") is pleased to announce the completion of a highly successful Phase 3 drilling program at Moosehead. Final assay results are expected in mid to late April, at which point the Company will focus on compiling, interpreting and modeling data received from the three phases of drilling as well as down-hole camera work, structural interpretation and geophysics in order to prepare for Phase 4 drilling later in 2019. 21 holes totaling approximately 4,715 m completed, including eight holes from the ice on North Pond. Logging and sampling are expected to take two weeks to be completed, with final assays expected mid to late April. All holes encountered significant intervals of shearing and quartz veining with many holes cutting multiple zones. At least seven holes, MH-19-50, 52, 53, 56, 61, 62 and 63 (including five from the ice) intersected visible gold bearing quartz veins, highlighted by MH-19-62 which cut three separate veins from 0.30 to 0.90 m thick (core lengths*) with the 0.90 m vein carrying widespread, fine visible gold within a strongly mineralized section from 240.00 to 244.50 m downhole, located 110 m northeast of discovery hole MH-18-01. Strike length of Eastern Trend shear zone extended to at least 175 m, remaining open along strike to the north and south, and to depth. Timothy Froude, P. Geo., President and CEO, states: "We are extremely pleased with the results from the third, and quite possibly the most successful drilling Phase of drilling at Moosehead. 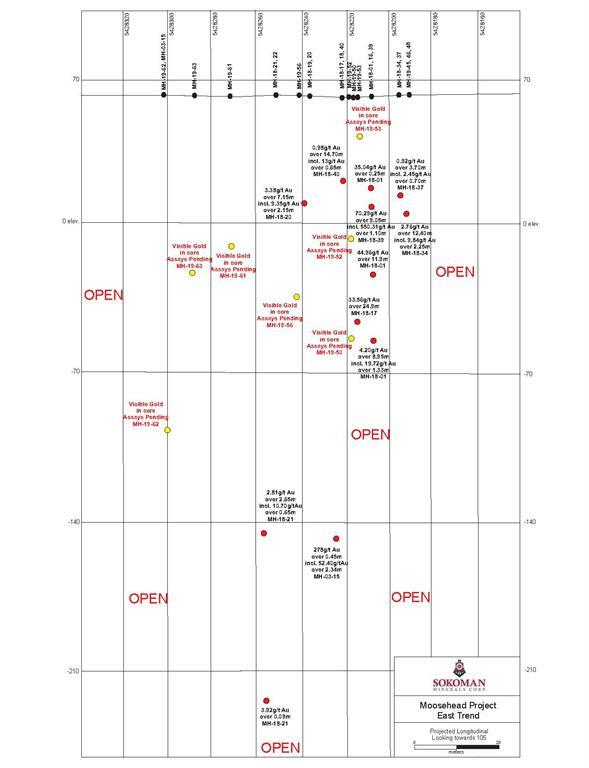 While our window for effectively testing the Eastern Trend has temporarily closed, we anticipate a barge-based diamond drill program to take place later in 2019 so as to continue evaluating and expanding the high-grade mineralized zone. With a healthy treasury of just under $3 million, we are well positioned to take Moosehead to the next level. We also intend to complete drilling on the nearby, epithermal style, Clarks Brook property during Q2 2019, testing for high-grade mineralization we believe may exist below the known mineralized zones." This news release has been reviewed and approved by Timothy Froude, P. Geo., a "Qualified Person" under National Instrument 43-101 and President and CEO of Sokoman Minerals Corp.
*True thicknesses from Phase 3 holes are believed to range from 75% to 100% of core length. Sections will be provided once completed and updated with final assays. Sokoman Minerals Corp. is a discovery-oriented company with projects in Newfoundland & Labrador, Canada. The Company's primary focus is its portfolio of gold projects in Central Newfoundland on the structural corridor hosting the 4.2 million ounce Valentine Lake gold project 150 km southwest of the Company's high-grade Moosehead gold project. The Company also has a 100% interest in an early-stage antimony/gold project in Newfoundland recently optioned to White Metal Resources, as well as a 100% interest in the Clark's Brook Gold Property, 35 km southeast of Moosehead. In Labrador, the Company has a 100% interest in the Iron Horse (Fe/U/REE) project.